(CNN) - House Speaker John Boehner said Tuesday the tea party and conservative Republicans are basically one in the same. As establishment Republican candidates try to fend off a series of tea party challengers in Tuesday's midterm primaries, Boehner sought to quell the apparent divide between the two factions in his caucus. "I think the tea party has brought great energy to our political process," the Ohio congressman said when asked about Tuesday's contests. "You get in these primary elections – they are hard-fought battles and sometimes – listen, there is not that much, not that big a difference between what you call the tea party and your average conservative Republican," he said, pointing to the GOP's near-unanimous opposition to Obamacare, tax increases and an overbearing federal government. Boehner's assurance comes after the 12-term Republican lawmaker easily defeated two tea party-backed candidates in his Ohio district earlier this month. Across the country, six states hold primaries on Tuesday. Senate Minority Leader Mitch McConnell faces tea party challenger. He's expected to cruise to re-nomination for a sixth term. Still, many Republican lawmakers might not have such an easy path to November. Eight-term Rep. Mike Simpson in Idaho faces a serious primary challenge. And an open Senate seat in Georgia has a slew of conservatives scrambling Tuesday for the GOP nomination. He's right. Tea Party says "NO, it ain't in the Constitution". Boehner/GOP says "HELL NO, it might work & Obama would get credit". "the tea party and conservative Republicans are basically one in the same"
"Republican candidates try to fend off a series of tea party challengers"
You realize those two statements paint a different picture right? The reality is the GOP, desperate for support, courted the extreme tin foil folks in the TP. Now they are wandering around in GOP-ville spouting conspiracy and lunacy and the GOP realizes they have a big problem. Maybe voters will finally see that the Koch funded TP is not nice, not patriotic, not for America, and often not in touch with reality. Oh noes crybaby! You let the cat out of the bag too soon! You weren't supposed to make that announcement prior to the November mid-terms! I've been referring to them as the Grand Old Tea Party since 2008. I first heard of the Tea Party before the 2008 election. 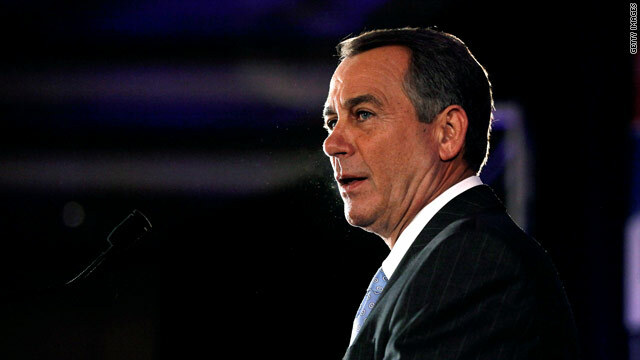 House Speaker John Boehner said Tuesday the tea party and conservative Republicans are basically one in the same. Well, there you have it: Boehner admits that the inmates run the asylum. I hope the Dems play this bit often before November, because we all know that–once the primaries are past–.the GOP whackadoos are going to try to distance themselves from the equally whacky TPers. "You get in these primary elections – they are hard-fought battles and sometimes – listen, there is not that much, not that big a difference between what you call the tea party and your average conservative Republican,"
I beg to differ. The republican deity Ronald Reagan would not be considered a republican today because he raised taxes multiple times. He would be demonized by the Tea Party and called a liberal. There is no room for moderates in the republican party today. Either you're a far right extremist, or you're not a republican. Lynda/Minnesota....For what its worth, Then Senator Obama in 2007, addressed the very issue of the Va's problems and said it would, on his watch, become more transparent and better beause of the tools that his administration would make available. That was 6 1/2 years ago and now this. Why? He said he'd take the bull by the horns and it would get fixed. Yet we have the current situation. Just answer Why? I understand your need to run circles around me with your Anti-Obama blah but this is an issue dear to my heart which for me transcends party affiliation politics. ThinkAgain: Don't like Congress? Get rid of the repub/tea bag majority. "The reality is the GOP, desperate for support, courted the extreme tin foil folks in the TP." Just as they courted the gun nuts, the religious nuts, the anti-gay nuts and the anti-choice nuts. Karl Rove is behind this strategy – because he and everyone with a working brain knows that the gop has no track record of success. The only answer is to vote out all the gop/tea bags and let the rest of us get on with continuing to move our country forward. November 4, 2014: Get out and VOTE! The Tea Party and conservatives are one and the same??? You must have graduated in the top of your class, John!!! Even an idiot knows both wings of the party are corrupt, bought-out, stupid, and ineffectual at governing. Besides. It's almost happy hour, Mr. Speaker. Shouldn't you be drunk as a skunk right now? The Tea Party used to be different........they used to be about responsible government, until the religious right saw an opportunity to be heard, in the conversation for more responsible government. Now the religious right has infiltrated both......the GOP and the Tea Party. Those who are primarily religious right candidates, from either group, are simply motivated for the wrong reasons.........the religious right wants to impose their religious views, some of which are down right weird, on the rest of us. We need conservatives who are focused on government, and not on religion. One story on CNN states that Republicans crush Tea Party, and this story ends saying that 2 Tea Party candidates will likely win over Establishment Republicans. Between 1944 and 2012 — a span of 68 years — exactly 4 U.S. presidents have attended Normandy D-Day memorial ceremonies a total of exactly 6 times. Barack Obama was one of them. It's people like YOU, bill, who the gop/tea bags rely on to continue to vote against your own self-interest, because you are DUMBER THAN DIRT. Uh-oh. Here comes John Boehner pandering once again to the extreme radicals in his party. Can't trust these fools no matter which way the wind blows. We never could trust them. GOPerville has become more and more desperate and less likely to understand MainStreet Americans and what THEY stand for. If they ever did care, that is. Which is up for debate. Jeremy Google the one drop rule. If you look at the Prez he doesn't even look bi-racial, he looks like a light skinned black man. My brother and his children are lighter than the Prez. And we're all black. That said, it was the racists in this country that called him black. We accept mixed people as one of us, whites don't. Well now that's settled can we move on to do something about our bridges, roads, ports and upgrade our electric grid?
" listen, there is not that much, not that big a difference between what you call the tea party and your average conservative Republican,"
This line will become a major soundbyte in the upcoming elections...just as much as the "etch-a-sketch" comment. This is one reason we are not going in the right direction. So little tom that makes you an expert on us? No dude it doesn't. Blacks accept mixed race better, not all do but many do. Melanin challenged people consider mixed couples race traitors. I see it and hear it all of the time. It's in your face every day, look at the names our POTUS is called every single day. I thought I asked you to stop talking to me. Just in case I didn't. I am now. I will not respond to you again. ""I think the tea party has brought great energy to our political process,""
And by "energy" he means "mindlessly hysterical race-resentment coupled with an ideological conniption fit and paranoid delusional temper tantrum."